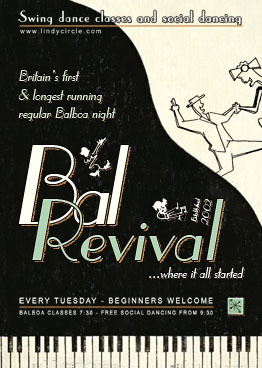 Bal Revival... where it all started! Learn how to dance the Balboa at our regular weekly club night held every Tuesday evening in Chiswick, West London. You don't need to bring a partner as people are rotated frequently during the classes. Comfortable, non-sticky soled shoes are recommended (ideally leather soled). The classes are follwed by a freestyle social dance until late. Balboa is an original swing dance that emerged during the late 1920's and early 1930's. It was created on the west coast (LA Region), while Lindy Hop was emerging on the east coast (New York). Both dances evolved to similar styles of music so it's easy to mix Balboa with Lindy on the social dance floor. Come to these regular weekly classes and join the resurgence in popularity in this great swing dance form where it all started - at the longest-running Balboa night in the UK! Please see the class level descriptions below. Although these are regular weekly classes we may have to cancel very occasionally. Please check the News pages and Calendar for details of specific dates before travelling, or sign up to our mailing list. See map. The nearest tube station is Chiswick Park on the District line, around 5 mins walk away. The classes are taught by Dan and Gemma Guest, renowned instructors who have taught at swing dance events throughout the world. Dan was instrumental in the revival of Balboa and is a respected dance historian, having spent a lot of time with many of the original "old timer" dancers who used to dance Balboa "back in the day" in the 1930s and 40s. Along with his former partner Christi, Dan is widely credited with bringing Balboa to the UK and helping to popularise swing dance both here and more widely in Europe. Dan and Gemma have a relaxed and lighthearted teaching style, emphasising good lead/follow technique and solid basics. Excellent communicators, they have a knack for explaining complex ideas in a fun and friendly manner. This class is aimed at people who are new to Balboa, those that have been dancing Balboa for a short time, and higher level people who still want to improve their basics. The focus will be on how to lead and follow pure Balboa, some common pure Bal and Bal Swing basics, and easy transitions between the two. After the beginners' class, if you're not yet ready to join the intermediate class then you are welcome to stay and watch, or head to the bar for a quick swig of dutch courage before the social dancing. Once the fundamentals of pure Balboa and Bal Swing are truly second nature, it is time to join the intermediate class (you are of course most welcome to continue coming to the Beginners class to recap or to work on improving your Balboa skills). In this class you will learn more complex moves based upon the fundamentals learned in the beginners class. We work on more detailed refinement of lead/follow technique to enable you to dance competently at all tempos. �Dance elements such as dynamics, musicality, syncopated timing, and other topics will also form part of these classes. Note: You should already be comfortable with throw-outs, out-and-ins, ad-libs and transitions before joining this class. What is leading/following? Which should I do? In partner dances such as Balboa and Lindy Hop, two people dance together, with one partner taking the "lead" and the other partner "following" along with what the leader is doing. Although very different in some respects, both leading and following are active roles. Although the leader generally determines the overall shape of the dance, both partners are free to improvise and influence where the dance goes and how it responds to the music. The beauty of partner dancing is that your partner often inspires you to do things that you would never have come up with on your own. The physical dynamics of dancing with a partner also allow movements that are difficult or impossible to achieve when dancing solo. It is a classic example of synergy, where the whole becomes greater than the sum of the parts! Traditionally, men would lead and women would follow. However, these days of course it is entirely up to you which role you do. In fact, we encourage everyone to try both roles at some point. Most people find it easier to stick to one role for a while when they are first learning, but once you are getting more comfortable with your dancing we encourage you to try the other role as well. Ideally, you shouldn't leave it too long - it can be a bit harder to change once you have habits too firmly engrained! It is a very different experience to lead or to follow - it is almost like doing a different dance! - and it is a shame if you miss out on half of the possibilities by limiting yourself to one role. However, some people have a natural preference for one role or another, so it is absolutely fine to stick with one role if you prefer - you just don't know which you might like best until you try both! Learning at least a bit of both roles will also make you a better dancer. It is difficult to fully understand how to lead unless you also know at least a bit about how to follow, and vice versa. Finally, you will never have to worry about whether there are enough leaders or followers to dance with if you do both roles, because you will be able to dance with everybody! Time to mix and mingle, with music to suit Balboa, Lindy Hop and other styles of swing dance. This is what it's all about - having a go at improvising with the steps you've learned (and maybe making up some new ones!) and just enjoying yourself with the music and your partner. Feel free to ask anyone to dance - no need to be afraid. We all started out as beginners and remember how intimidating it can appear sometimes! The main thing to remember is that you don't have to do everything perfectly, so don't worry about going wrong. In fact, there is no right or wrong in swing dancing - there are only guidelines... and endless variations! We play a wide range of styles and tempos of swing music. 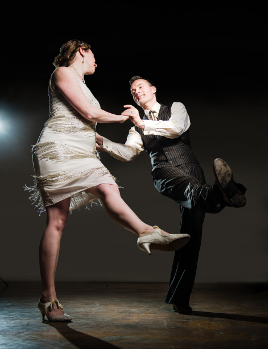 The era in which it was recorded doesn't matter so long as it feels good for swing dancing. More important to us are the style, musicianship and quality of recording. Essentially, we are a 'full on' traditional style swing night - no compromise! The social dancing is free and is open to anyone from any style of swing dance, so if you're in the area feel free to drop in and have a dance with us!